Petition: Why B K S Iyengar deserves the Nobel Peace Prize! 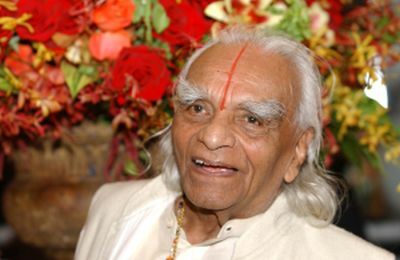 OK all ye passionate yogis – let’s help BKS Iyengar get the recognition he so richly deserves. VOTE NOW!!! Sign the petition to award the Nobel Peace Prize to renowned yogacharya B K S Iyengar! It’s that time of the year when recommendations are sent to Oslo for the Nobel Prize, an exercise which closes on February 1. So far, in the 113 years that the Prizes have been awarded, only a handful of Indians have been so honoured. Rabindranath Tagore. C V Raman. Hargobind Khorana. Mother Teresa. Subrahmanyam Chandrasekhar. Amartya Sen. Venkataraman Ramakrishnan. Just one Indian — someone who was born inAlbania, but later became a naturalised Indian — has won the Nobel Peace Prize, ironical considering that India gave the world the concept of Shanti (universal peace) and Ahimsa (non-violence). By the way, the Apostle of Ahimsa, the man who brought a mighty empire to its knees by his message of non-violence, was overlooked by the Nobel Committee. It is time to rectify this omission. As with every other nation, in India too there will be many, many, claimants. Well-known and lesser-known peace activists. Politicians with claims to nurturing amity. Towering over them is the most famous living exponent of India’s biggest soft-power export to the world. The country’s most well-known yoga guru alive. He turned 95 in December, and it is a tribute to both his personal practice and the amazing power of yoga that at his age when lesser men would be contemplating the hereafter, he not only keeps a punishing schedule of teaching, but also ensures that his own personal practice is unhindered, including the king of all yoga asanas, the Sirsana. Two years ago when B K S Iyengar traveled to China to set up a yoga school there, he was given a rock star welcome. In his own country, home to the ancient science that has wowed modern times, he remains less feted, although an icon to the legion of believers. To this day, B K S Iyengar’s books on yoga remain the definitive treatise on the subject for those on the path, ranking alongside the ancient Yoga Sutras by Patanjali. Whatever be the lure of yoga to its practitioners — from washboard abs to good living, it could be anything — at its core lie the principles of Shanti and Ahimsa. It is an ideal to be pursued, as B K S Iyengar has shown us through his long and illustrious life. Surely, there can be none more qualified to be awarded the Nobel Peace Prize than such a great man. Please do sign the petition to the Nobel Prize Committee to grant B K S Iyengar the Nobel Peace Prize. We will ensure our collective plea reaches the Nobel Prize Committee in Oslo by February 1.